Everyone want their events to be successful. A successful event requires immense hard work and competitive planning. Events organized can either be for one’s own people or for people coming from outside. For example, a school may arrange a farewell function whose guests will be the students themselves but if the same school organizes a debate competition it may invite people from outside including a chief guest as well. Talking about the later, when it comes to inviting people from outside as visitors you now as an organizer need to work on some areas. You need to be specific with your guest list. An invitation card by your organization must be sent to them. The time of arrival is mentioned on the card. The difficulty in doing so is that how will you know that all the invited guests have arrived? It is humanly impossible rather tedious to count each guest and then reporting that all have arrived. Here’s a solution to this. The Event Sign-in sheet. 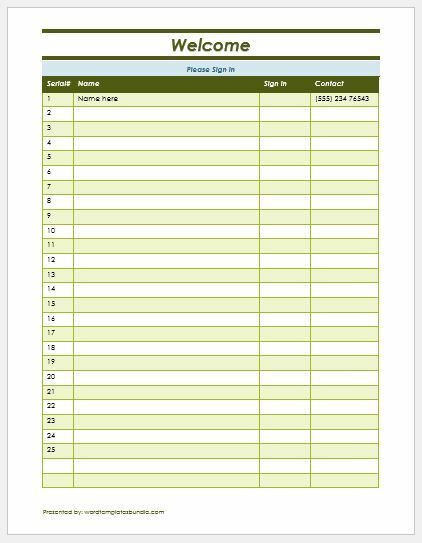 The event sign-in sheets are specifically designed for guests to mark their attendance at a specific event. It lets the organizers know that who came to attend the event and who did not thus count the number of attendees. These sheets are placed at the event venue and normally you must mark your attendance before going to the desired hall. Guests with a valid invitation are there in allowed to attend the event. The Chief guest or guests are easily identifiable. Easy to know that who was on time and who was late. Data regarding the gender mix of people at the event can be collected. Information with respect to people’s occupation can also be collected for example what percent of either engineers or teachers attended the event. Future surveys can also be conducted online by collecting information from the invited guests. If for instance, you are working for a charitable organization or an NGO you can even contact these persons for donations when needed. Organizers planning for an event go for the use of event sign-in sheet and see the remarkable difference it brings.